Clients of TD Bank’s TD Direct Investing will have new tools to build their own financial plans and portfolios – thanks to a newly-announced collaboration between the Canadian bank and fintech innovator Hydrogen. The two companies have entered into a licensing agreement that will integrate Hydrogen’s APIs into TD Bank’s WebBroker platform as the first phase of the partnership. “This is the first of several significant building blocks that will deliver a fully integrated, digital investing experience for TD clients,” Tony Ierullo, VP of Wealth Digital Innovation for TD Bank Group, said. “While our initial focus is on improving the self-directed investor experience, our ultimate goal is to bring best-in-class digital investing solutions to all TD clients, at every stage of their financial journey.” The agreement marks the first instance a Canadian bank has provided customers with the technology to build financial plans and investment portfolios on their own, all of which are integrated into the customer’s online brokerage account. Additional resources are planned for the platform, including the creation of a direct access digital advisor. Once additional phases of the rollout are underway, clients will have access to a fully-integrated, end-to-end digital investing platform for both self-service and “advice-led” investing – as well as those who want a mix of both. Hydrogen demonstrated its technology at FinovateEurope 2018, building a European savings solution – including UI/UX, onboarding, backend connectivity, and business intelligence – live on stage in five minutes. The firm’s APIs enable companies to save tens of millions on building and running a variety of financial services apps. The company is also the maker of the Hydro blockchain, the public ledger for financial services, and Ion AI, a machine learning technology for financial apps. Last month, the company launched the FINDI Consortium to “facilitate a more open, transparent, and decentralized global financial system” powered by public blockchains. In July, Hydrogen introduced the Hydro mobile app, a security and identity management solution that leverages the public blockchain. Winner of the grand prize at the Luxembourg Fintech Awards this summer, the self-described “Stripe for fintech” was founded in 2017 and is based in New York City. The ongoing migration to mobile provides financial institutions a chance to reboot their approach to delivering information digitally. Digital banking v1.0 (desktop online banking) was primarily about porting paper-based statements into an online format. It was a huge change and made banking more convenient, though not really any more effective than the paper-and-call-center system it replaced. Digital banking v2.0 (mobile banking) is where modern processing power and machine intelligence pays off. Banking becomes not only more convenient, but much simpler, less time consuming, and helps consumers make better financial decisions. But to get to those payoffs, FIs need to provide advanced features, that we in the industry call PFM (personal financial management). But it’s hard to transition entrenched desktop-banking users to the more powerful PFM platforms. Many customers have been happily using desktop-online banking for a decade or more. And it’s a painful process to move them into what looks initially like a more complicated system. So some FIs are gently pushing users into the future by offering ONLY a PFM-based native app. The largest U.S. financial institution to use that approach is Seattle-based BECU, the fourth largest credit union in the nation, with nearly 1 million members and 350,000 using mobile banking (up 75% in the past year). A year ago, the credit union replaced its simple mobile-banking app with a fully PFM-integrated version powered by MX (see them at FinovateFall next week). CU members using native apps (Apple, Android, Windows) now do all their banking through a full PFM interface. It’s a good long-term move. Users expect, and need, more functionality than simple balance lookup and funds transfer. But making such a big change all at once carries risks too. With more than 200,000 users at conversion time, there ensued some initial member grumbling, inevitable with such a big change. But the latest version released in May 2016 carries the highest 5-star rating, so apparently users have come to grips with the change. You can see the reviews in the iTunes and Google Play stores. Check out the MX case study for more details. The full-conversion approach used by BECU may be the fastest way to move customers into the future. But to minimize initial pushback and work out any UX hiccups, grandfathering the old app could provide some breathing room. Or call the new version “Pro,” charge $1.50/mo for it (waived for a few months), and let both versions live side by side indefinitely. TD Bank in Canada offers the Moven-powered MySpend app as an add-in to its regular mobile banking app (see Moven at FinovateFall next week). Alternatively, users turned off by a the full-featured app can be referred to the mobile website with instructions on how to save it as an icon on their phone. As long as you have a reasonably responsive, well-designed site, non-power user customers will be satisfied. The BECU Money Manager has a start page (inset) that includes links to a tour, FAQs, new member application, online banking enrollment (required for mobile banking), location finder, and a link to the full mobile website. I’ve always been a “wanna be” tracker. I like watching the stats closely, but I also lose interest if the process, either capturing the data or compiling it, becomes tedious. But thanks to mobile (including wearables), the drudgery is disappearing and that has big implications for banking and financial services. Some examples: I’ve used Mint since 2007 for personal and business expenses, so I have a massive database of transactions, which in theory should make it easy to locate just about anything I’ve charged to a credit or debit card in the past eight years. However, it’s never quite perfect because I will go for long periods without doing the required maintenance to keep every aggregated account flowing. Recently, I just fixed one of my main credit cards which has been on hiatus for two years. So, there are big holes in the data. Then there’s BillGuard, another service I love and have been using for years. I love how it alerts me to questionable items as they hit my card accounts. However, BillGuard’s database is so good, that I rarely hear from them any more. This is good news for me (no questionable items), but less so for them. Because what’s invisible, loses its perceived value. And I’ve tried tracking other things over the years, both financial and personal. And nothing seems to stick. Until now. I just hit my two-year anniversary using Fitbit, usually glancing at its tiny readout several times per day. So what is it about Fitbit that makes it addictive? And more importantly, how can financial institutions do the same for money management? 1. Make it easy to use: While Fitibit requires zero maintenance once you get it activated, you do have to remember to keep it on you. The same goes double for a bank’s credit or debit card. You not only have to remember it, but also must choose to use it at the point of sale. Action item: Incent users to get your card loaded into digital ecommerce sites such as Apple Pay, Amazon, iTunes, PayPal, Uber, Spotify and others. Capital One just unleased a great, albeit expensive, program with Uber to credit back 20% of rides to its cardholders (link). 2. Make it easy to see exactly where you stand in real-time: Fitbit provides feedback literally every step of the day. It’s extremely motivating, though at times discouraging when you fall way behind in personal goals. Card issuers today do something similar delivering real-time alerts right to the smartphone homescreen (and soon to the Apple Watch). But transaction alerts still don’t tell you where you are. Action item: Make notifications smarter by including daily, weekly, monthly transaction summaries and/or credit available. They could be included in the notification, or enabled with a swipe of the transaction alert. 3. Make it easy to compare to previous periods: This is still a missing piece of my ultimate Fitbit experience. The mobile app makes it easy to scroll backwards or look at bar charts to see how you are doing over time. But there are no simple month-over-month or year-over-year comparisons to see your progress in similar time periods. Action item: Create single-click views of financial activity and balances compared to one month ago, one year ago, two years ago, etc. 4. Provide ongoing incentives: Similar to saving money being its own reward, burning calories by walking and climbing is clearly its own incentive to bump up your Fitbit numbers. But it doesn’t hurt to provide extra incentives along the way. An incentive can not only keep customers engaged, but also appreciative of the game provider. Unlike BillGuard, which so quietly goes about its business that I forget about it, Fitbit delights users with badges and pop-up notifications, for hitting various daily or lifetime milestones. (Fitbit actually needs to do more incentivizing, as experienced users can rarely get a new badge; I haven’t had a new one since last November). Action item: The badges may be cheesy, but the email congratulations are powerful (see inset from Fitbit the first time you walk 20,000 steps in a day). This has to be one of the simplest things you could do to reinforce good money management. Send an email congratulating a customer when their savings balance, rewards points, interest earned, or whatever, increases compared to a month ago or a year ago. Who doesn’t appreciate an “atta boy or girl” every now and then (even if it is from your bank). 5. Get social: While I’m not of the social media generation, I do understand its appeal. Just today, Fitbit sent me a reminder to add friends. This allows users to compete against friends and family, a potentially motivating way to get you off the couch and moving. And while I’d never share Fitbit data with friends, I do enjoy a friendly competition with my wife. The key is to make sharing highly selective, customizable, and easy to switch on and off. Action item: While financial information is not as readily shareable as fitness data, Venmo has proven that it has potential. The youthful set who’ve taken to using Venmo (see the Venmo line), enjoy sharing payment activity, but only without revealing the actual dollar amount, and allowing for maximum snark in the share. And there are also plenty of serious use-cases for sharing financial data, such as employees with their employers, kids with their parents, etc. Card issuers should add optional sharing to all card-management platforms. 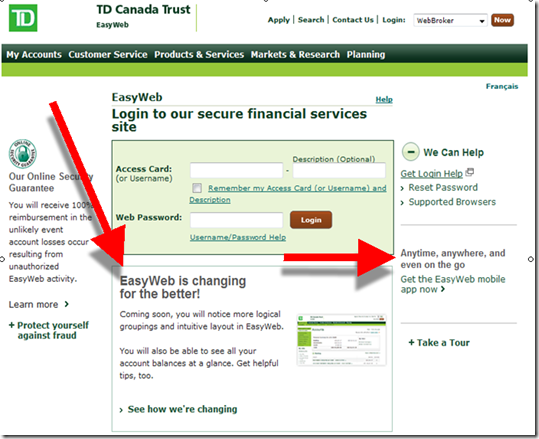 Picture Credit: TD Bank has been giving away Fitbit Flex trackers to new checking account customers (screenshot above). A reader from MaximizingMoney.com contributed this upper-right photo of TD signage in the NYC subway. It’s no secret that a first-time online banking visitor has far different needs than the power user returning for login #1,712. 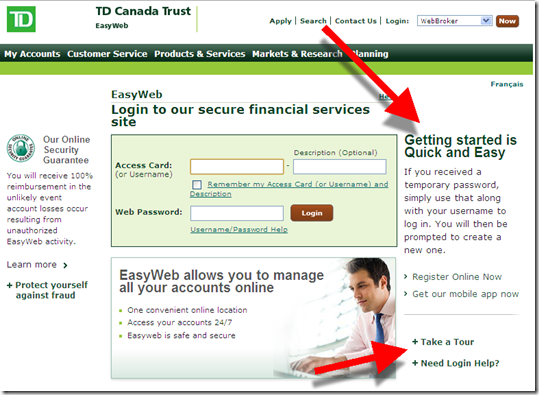 But most banking sites provide the same visual login treatment for all users. That forces new users to search out buried "getting started" or "register" links. Or they will make time-consuming, and expensive, phone calls to customer service for guidance. And the one-size-fits-all approach is not optimal for experienced users either. As they skim by the static boilerplate in the banking version of banner blindness, power users miss the chance to learn more about new features and promotions. After selecting login on the homepage, new users are shown a page with prominent help on how to get started along with links to register, take a tour, get help and so on (see first screenshot below). 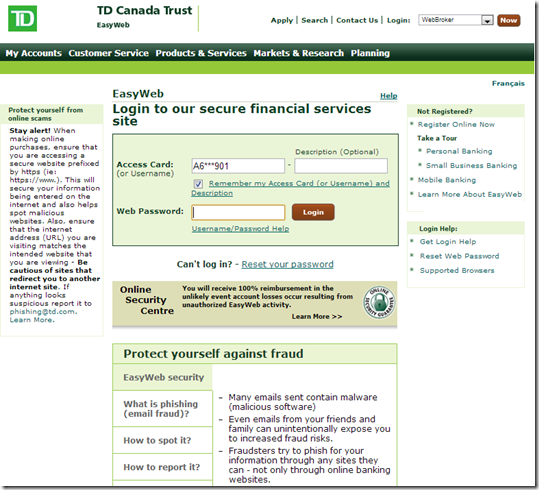 Previously logged in visitors see a page featuring a banner below the login box emphasizing a single online banking feature and contextual links on the right (see second screenshot). For reference, see how Chase Bank handles new and existing visitors.